This is my first try of home made wine which i gathered information from many pages..This wine was very good than my rice wine.Think all will be busy shopping ,preparing cakes&cookies ,etc.We too have finished our shopping, kids are waiting to go to native to celebrate Xmas, I a uch worreid as they are not studying for their exams.This second wine i tried along with it is rice wine. 1.Wash the grapes and pat dry well.I cleaned it kept on a towel overnight to absorb all moisture. 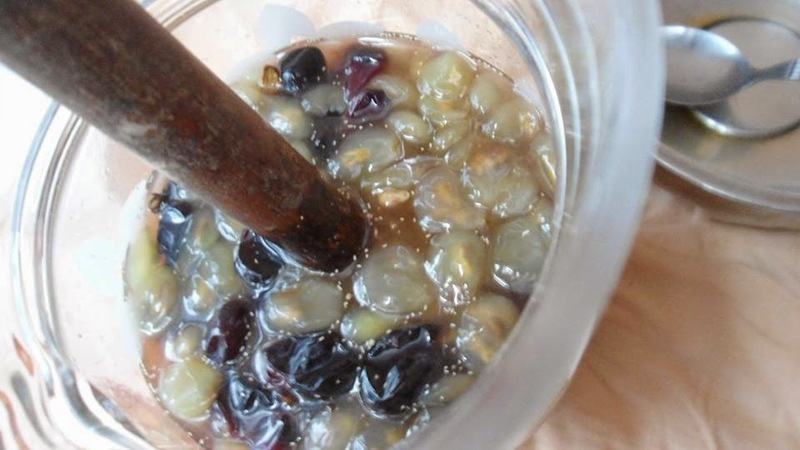 2.Put the grapes in the vessel and crush it well.i did it well a wooden spatula didn't use hands. 3.Add all the ingredients to the crushed grapes. 4.Cover it well & keep it & store it in a dark place. 5.Stir the wine everyday with a wooden spatula(don't use metal ),do it for 21 days. 6.Your will notice air bubbles forming on top when fermentation take place. 7.After 21 days or when the fermentation stops drain it through a muslin cloth/stainer to clean dried vessel. 8.Bottle it in cleaned dried one. 9.While pouring carefully pour without disturbing the sediment. 10.The longer the wine stored better the taste. 1.The colour of the wine depend on the grape type you use.Use dark black to get rich colours.I used the ordinary one so my colour was like this. 2.Adding cloves& cinnamon gives nice spicy aroma and flavour,you may skip if u don't like it. 3.For more darker colour you can add 1\4 cup caramel while making.It gives deeper colour. 4.Use only clean dried wooden spatula for mixing. Delicious grape wine. I love to taste some. Delicious, amazingly made grape wine dear.